The Ministera of Rural Development at the Otuyo plant innauguration. Otuyo is a small quinoa growing community located along a winding dusty road that stretches between the salt flats, quinoa fields and free-range llama herds before climbing the volcanic ridges, until it meets Chile. About 60 families have houses here though when the growing season starts, it looks like a large city with lines of cars and trucks as family members drive in from far off places to participate in the quinoa production. It was not always like this. Otuyo used to just be a dusty outpost on the edge of the salt flats, but with President Evo Morale’s development programs in the countryside, it now has electricity, a church, a new school, a covered central meeting place and as of yesterday, a full operating, export quality, quinoa processing plant. Yesterday, I traveled with the indigenous governors and the Mallku, the regional leader, to participate in the inauguration of he plant. The mayor of Salinas, Oruro, representatives of the Pro Bolivia program and the Minister of Rural Development herself would all be in attendance. This was a big thing. 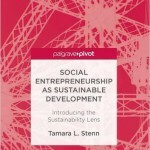 The community came together to enter into a national competition for a rural development project. Out of the 150 applicants, Otuyo was selected as the one whose project would be realized. This was not an easy achievement. In 2011 they had entered into a similar competition, and was not selected. Not to be deterred, they banded together anew with more organization and coordination with community members contributing more than 3,500 Bs towards the project. With almost 360,000Bs raised ($51,428 – though remember1Bs has the buying power of $1 in Bolivia), and a nephew in the mayor’s office who was able to give them good advice and feedback on the proposal writing, they won the project. 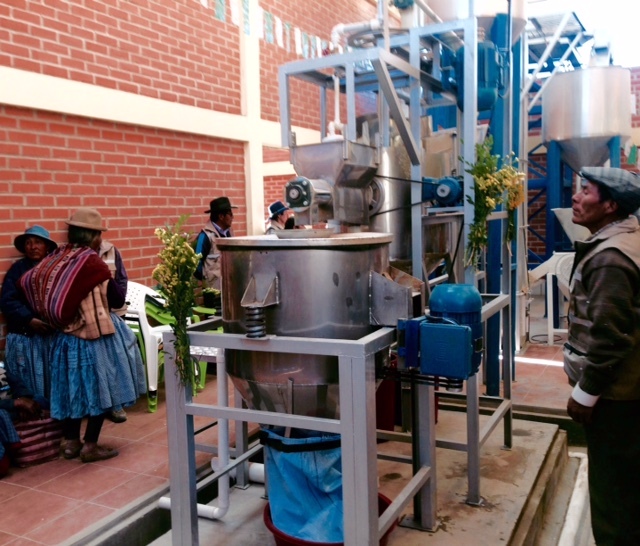 Newly functioning Otuyo organic quinoa processing plant. The intent of the plant is to give the people more direct access to local markets, by being able to process and develop their own quinoa for use in school lunch programs in the Department of Oruro, local markets, and export. 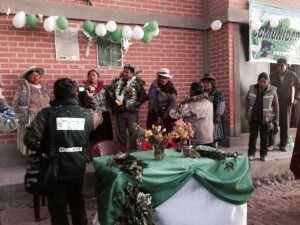 It was the first step in a much larger process which would include getting further funding for further plant expansion to include a food processing laboratory and equipment, storage space for warehousing quinoa and a walled-in solar drying space that would protect the seeds from dust, but have access to the strong Andean sun. The place was artfully designed by local architect, Alfredo Perez, the cousin of one of the Indigenous Governors, I was traveling with. It was made of brick with high ceilings, ample windows and skylights, and many room for administration, packing, processing plus lots of room for expansion. The festivities began around 3pm. 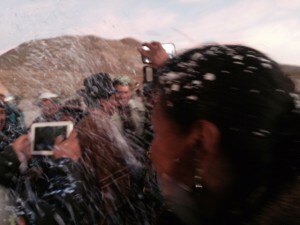 There was a parade with Andean musicians, dancing, a plethora of speeches, blessings, honoring of dignitaries with wreathes of flowers, the spreading of good luck to all by copious amounts of mistura (bits of colorful confetti) placed on people’s heads, alcohol, beer, cocktails and blessings said by all. Then followed a tour of the plant and a demonstration of the quinoa processing machinery by engineers in while lab coats and face masks. More blessings, music and cheer resumed and then a traditional meal of roasted llama meat, quinoa and boiled potato was served to all. In all about 150 people were present. After the meal, cases of beer were brought out and people began heartily celebrating again. I went over to talk to the representative from the Pro Bolivia program that funded the project to ask her about her work and the objective of Pro Bolivia, a government program I was not familiar with. She explained the program started in 2010 as a way to build more economic development within the country, mainly though business development projects. They were mostly city based and it was unusual they were working in the countryside. I noticed her city attire and her apparent discomfort with the rural traditions and celebrations. She asked me about my work and when I explained I was a professor for eh US studying women’s well-bing and quinoa production, she immediately lit up. “That is a very important topic,” she said. “The women here are totally repressed, they say they do everything together with the men, but they do not. They do it all themselves and all the men do is this,” she nodded over to a group of men drinking beer. “If you come out here when they are working you will see this.” I was surprised by the vehemence of her convictions. I admitted that from my work so far, it does seem that women are marginalized, though not just by the men but y each other as well. However from my studies so far, I had heard many stories of hard the work people put into the quinoa growing from both men and women, and could not imagine only women being able to do all of that work. Plus I myself often witnessed the women and men working together in the countryside. However, I did not want to get into an argument. I asked her how much experience she had with the Bolivian countryside. She admitted not much. Then she began talking about how women were not valued in the entire country of Bolivia, not just the countryside and how countries like the US and Europe had much better ways of respecting and honoring women valuing their college studies and such. I was surprised again by her anti-nationalist way of speaking, especially being a government representative, that was a thing of the past, I had thought. She then went on to explain it was not just Bolivia, it was all of Latin America that was like this. I reflected a moment and then admitted that yes there had been studies done in the US, showing Latina women putting more time into childcare and importance into family than non-Latina women. But I also pointed out the negative effect of US children being put in child care at an early age, having limited family interactions with everyone being so busy pursuing their own ambitions and the overall disintegration of the US family (high divorce, lack of contact with elders, loss of family connections). I explained there needed to be a balance between the two extremes. She seemed unconvinced. I politely invited her to my presentation on Andean women August 19th at the prestigious Catholic University in La Paz, and excused myself from the conversation. I did no feel like arguing whose country favored women best or the negative aspects of Andean women, though I did make of note to be more vigilant in my studies. I returned to sit with the women indigenous Governors, leaders who were working more directly towards improving lives for Andean women. As the sun was setting over he volcano-ringed salt flats, a car appeared in the distance. “It’s the Minister! She is here!” came the cry picked up by all. All piled outside into the rose colored dust of the evening light. The Minister stepped out of the blue Toyota SUV (the only car that function in Bolivia’s harsh environment) and was greeted with cheers, hugs, and a cell-phone and camera-bearing mob that reminded me of paparazzi scenes from the movies. She wore traditional dress with braids, a full pollera skirt from the highland region, wool leggings, a sweater and shawl. The people called her mother and the band as all quickly paraded through the new plant. Out front, more speeches were presented in the dying light as the cold wind whipped down from the mountainsides. The Minister was brought a shawl which she wrapped around herself, listening to the numerous presentations. The Mallku thanked her for finding time from her busy day to visit (she had been driven down from La Paz 12 hours away, earlier that day). The architect thanked her for giving the Bolivian people pride in themselves and helping them to direct their own development with funds from the government and themselves, instead of foreign gifts. This he felt brought dignity and respect to the people. All cheered for the village of Otuyo, Hyllalla Otuyo!, the Bolivian president whom some speakers described as a “brother of the countryside”, Hyllalla Evo Morales! and the marka (region) Salinas, Hyllalla Salinas! The Minister thanked everyone and praised the farmers for their quinoa production, their honoring of Pachamama through the teaching of their grandparents down to their children. She said they set an example for the rest of the world, who now looks towards Bolivia as a leader in sustainable development. She noted the Pope’s words in this and also the respect shown by other Latin American leaders and FOA, the United Nations agriculture programs. She thanked the people for their patience and preserving in their work and expressed her wish for people to live in the countryside, and not the cities, and enjoy a healthier, happier life. This elicited a roar of approval and more Hyllalla cheers for all. A hot quinoa drink was distributed and two beautifully decorated quinoa cakes were presented to the Minister. Then all hurried indoors to enjoy celebrating a bit more. I left with the Original Governors, sitting in the back of an open pickup truck watching the Southern Cross dance across he Milky Way which extended from the dark tops of the volcanoes far down to the lightly glowing salt flats.